Super Hero Boy: He's a big kid now with a big kid bed. He's a big kid now with a big kid bed. Connor informs me on a daily basis of how "big" he is.. and that he is getting "bigger, and bigger, and BIGGER, and will eventually be as BIG as Daddy!". Not that this revelation has not occurred to me before he mentions it but I cant help to feel a little heart broken every time I see the size of his big boy feet or when I change his clothes and realize that there is no part of his body that even remotely resembles the baby fat rolls he had just months ago. My biggest baby has somehow transformed in what seems like an overnight progression into a full fledged preschooler. I knew this day was coming and the arrival of his little brother looming over us a few months ago meant it was time to do a full overhaul of his room to prepare the way for two brothers to share one room. Moving Dylan into Connor's room hasn't happened quite yet as Dylan is still sleeping in the bassinet beside me at night to allow for easier feedings, but we did make the most important leap towards having both boys in one room and that was moving Connor out of his beloved crib. Actually the whole transition took longer than I ever thought it would as Connor was pretty attached to his crib and not that I blame him it's a great crib. Before Connor was born I searched high and low for a really secure, well built, modern looking crib that would not totally break the budget. I also wanted to buy a crib that was convertible as I really wanted something that we could keep long term and not two short years. I ended up settling on the Emily crib by Million Dollar Baby. I've never regretted that decision even for a second. 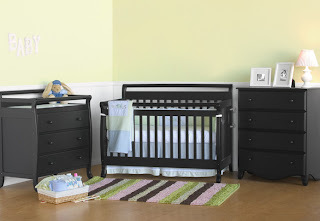 The only thing I will warn you about is we purchased our crib in black and though we have a house full of black furniture and I was well aware of this fact, dust, dirt, and MILK shows up very well on black furniture. 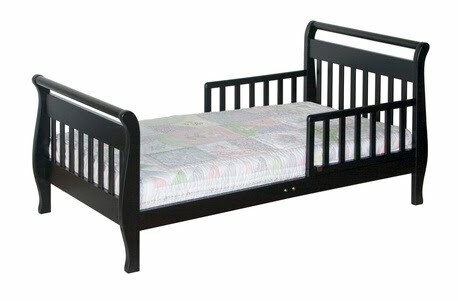 However, the crib is available in everything from white to black and everything in between. It's served us well and it still looks almost exactly like the day we bought it except for a little rub mark on the back where Connor decided to take a toy and slam in full force into the wall against the crib. So I knew I wanted a toddler bed that would match or Emily crib and hold up as well as I figure between the two boys someone will either be sleeping in the crib, toddler bed, or the crib converted into a full size bed for at least the next four to five years (and much longer with the crib conversion). The toddler bed had to hold up to a very active three year old and it had to match the Emily set we already had. The Million Dollar Baby Toddler Sleigh bed was the perfect solution. It matches our Emily crib perfectly and the price is more than reasonably priced as I've seen it priced anywhere from $99 (on sale) to $130. What I didn't expect was just how sturdy this bed was as it's a pretty small bed. We've been using it since around Christmas and though I was concerned that if I sat on the bed I'd damage it, I was not only wrong but I read to Connor in his bed almost nightly. So much so that on more than one occassion I've fallen asleep in bed with Connor. This actually happened to us the other night while I was reading to both Dylan and Connor in his bed. Somehow all three of us managed to snuggle up on the bed and fall asleep and we actually made it most of the night that way, well until Dylan woke up around 2am wanting to eat. 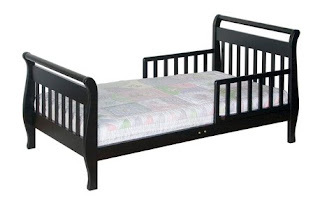 Regardless if your in the market for a toddler bed, crib, or even just some additional furniture for your nursery or child's room I can say from experience that we absolutely love our Million Dollar Baby furniture. You can also buy the same items at most major baby and departement store chains labeled under DaVinci Furniture as well. Disclosure: Million Dollar Baby was gracious enough to send us the Toddler Sleigh Bed to try out to write this review. However I purchased the Emily Crib and matching furniture out of my own pocket. My opinions and comments on items we review are always my own and are never influenced by sponsors.